Ring the changes by serving goose for Christmas dinner. The night before, chop the prunes and apricots to the size of raisins. Tip into a bowl and pour over the Armagnac or Calvados. Cover with clingfilm; leave to soak overnight. The next day, preheat the oven to 180°C, gas mark 4. Add the onion, Bramley apples, ground cloves and nutmeg to the dried fruit. Mix together well and season generously. Thoroughly rinse the goose under cold water and pat dry with kitchen paper. Fill the smaller neck cavity with the sausagemeat stuffing, then spoon the prune and apple stuffing into the larger main body cavity. Secure the skin flaps at each end with metal skewers. 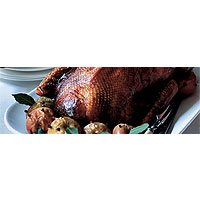 Weigh the goose and calculate the cooking time, allowing 35 minutes per kg, plus 10 minutes. Place on a metal rack over a large roasting tin. Roast for 45 minutes, pouring off excess fat. Return to the oven for the remaining cooking time, or until thoroughly cooked and the juices run clear, pouring off the excess fat regularly. Cover with foil and leave to rest for 15-30 minutes before carving. About an hour before the end of the cooking time, core the Cox's apples through the bases, leaving the stalks intact. Stud each with 8–10 cloves. Place around the goose for the final hour. Serve the goose with the apples, garnished with bay leaves, and Waitrose Apple Sauce with Cider.